I touched on this in a post last year but will now get down to the How To's. 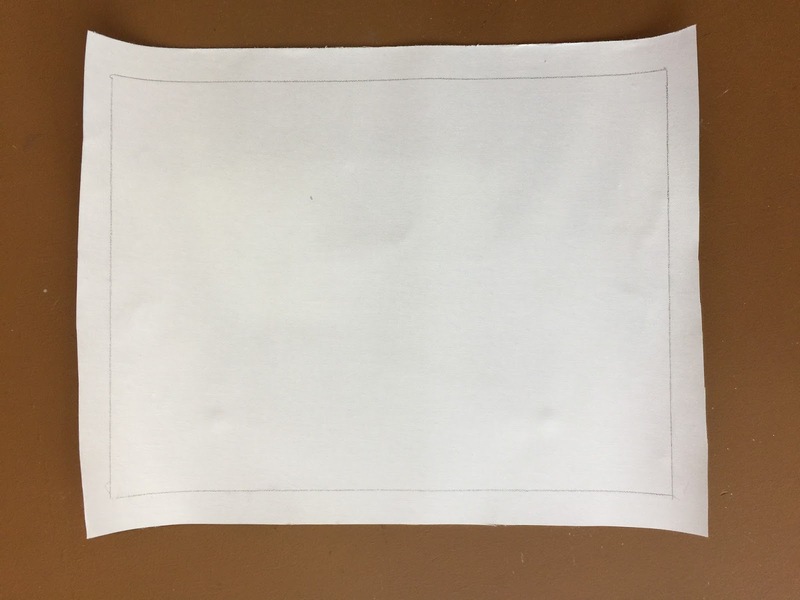 I have been making my own small panels for over a year and have found it to be easy and economical. 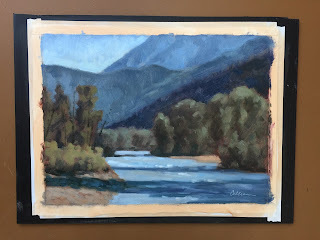 I use oil primed linen which I buy on sale in rolls and either Gatorfoam or hardboard panels. Gatorfoam is 3/8" so 2 panels will not fit in one slot in many wet panel carriers, including the ones I like from RayMar. 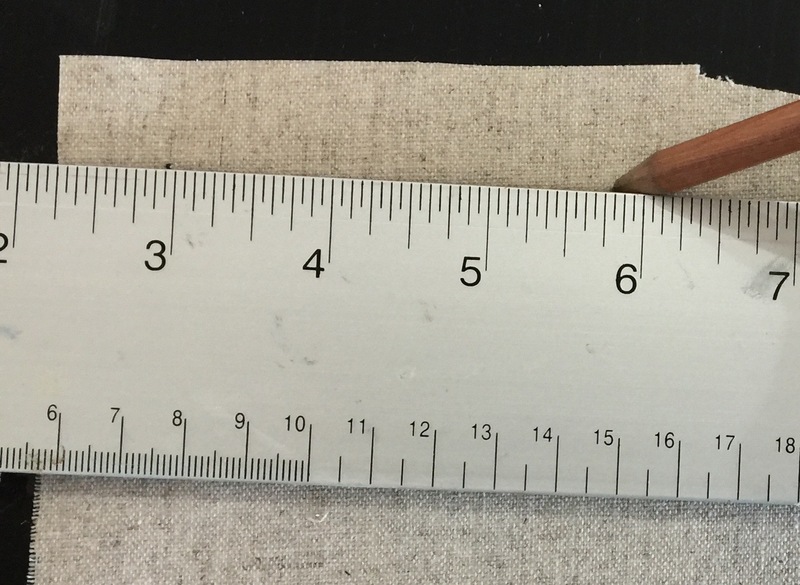 Hardboards are 1/4" thick and though 2 will fit, they are heavier. If I am going on a painting trip that involves air travel I keep my supplies as lightweight and compact as possible. 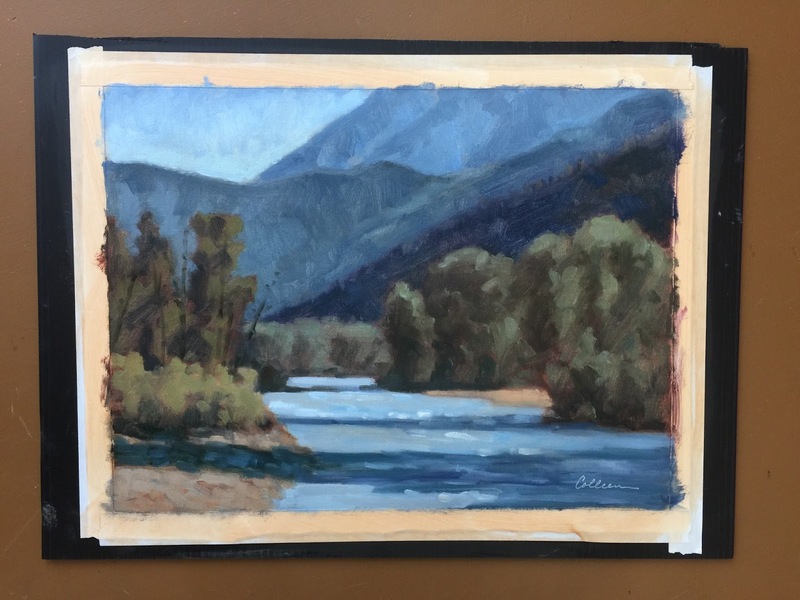 An artist friend of mine who travels frequently suggested that I paint on unmounted canvas taped to a support (I use corrugated plastic sheets) and mount the "keepers" later when I get home. 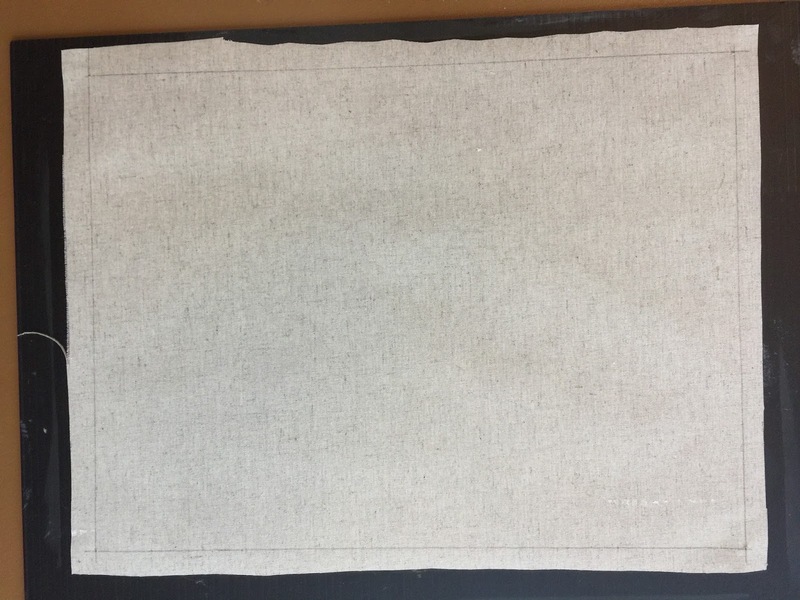 Pieces of canvas weigh almost nothing and take up very little space. I pack the number of supports I need for one day, 2-3 usually. At the end of the day I remove the painted canvases to dry and apply new ones for the next day. 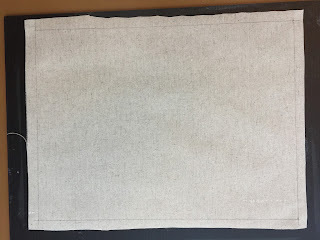 At the end of the trip I pack the painted canvases in a large storage baggie with pieces of wax paper in between. 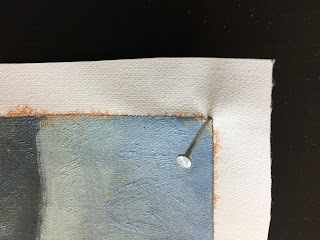 All of the "masterpieces" can be mounted after they are dry to the touch and here is how you do it. Links to the supplies are at the end of this post. The hand roller is called a brayer. I use neutral pH adhesive by Lineco but many artists prefer a product called Miracle Muck (cannot be shipped in cold weather). 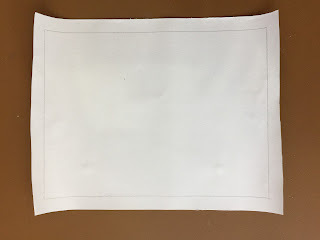 To get set to paint draw a line around your panel on the canvas. Cut it out with about 1" extra on the edges. Tape it to a support carefully lining up the tape with the drawn edges. I prefer white artists' tape but some use blue painters tape. 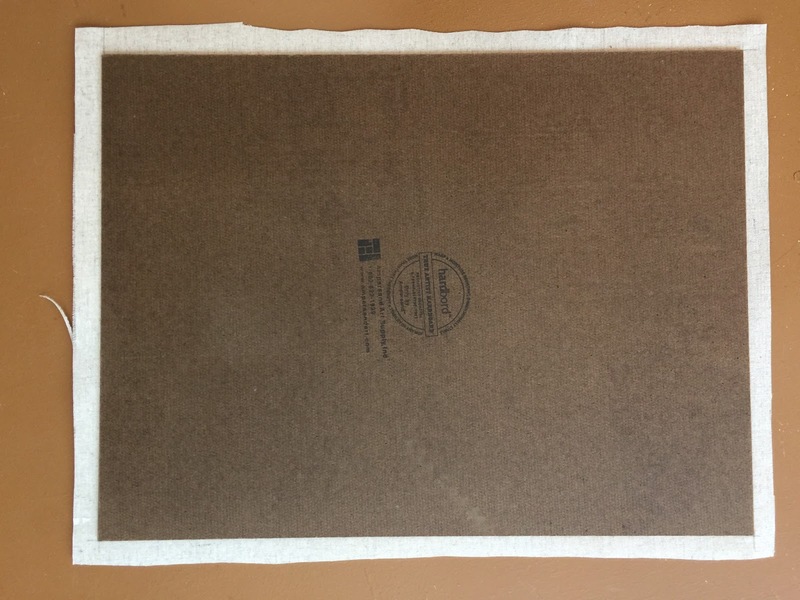 The exposed canvas is the size of the panel you will use later for mounting. Tone your canvas and the tape (unless you paint on white canvas). If you decide to send it to the landfill you have wasted very little, maybe $1. (And you didn't waste your time because we learn from our failed paintings, right?) If it's a keeper you can mount it when it is dry to the touch. 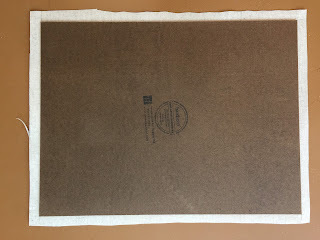 Remove it from the support and lie flat to dry so you can use the support to get your next canvas ready. The nail needs to be big enough to make a hole that can easily be seen on the back side. Next take your ruler and using the holes as a guideline draw the 4 sides with a pencil. 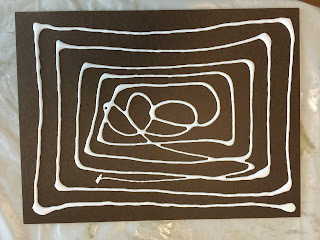 It should look like this- these lines show you where the edges of the painting are on the other side. Now spread the adhesive on the right side of your panel. 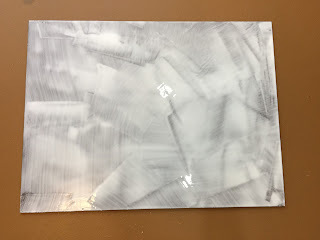 One thing I like about hardboard is that it is dark so it is easy to see that you have covered it completely with glue. I use a cheap hardware brush for this. Sponge brushes work well also but they absorb (and waste) a lot of the adhesive. Make sure you get plenty of adhesive on the edges. Carefully place the glue side of the panel onto the back of the canvas making sure that the corners touch the nail holes and the sides fit within the pencil lines. Turn it over and use the brayer to adhere it and remove any air bubbles. 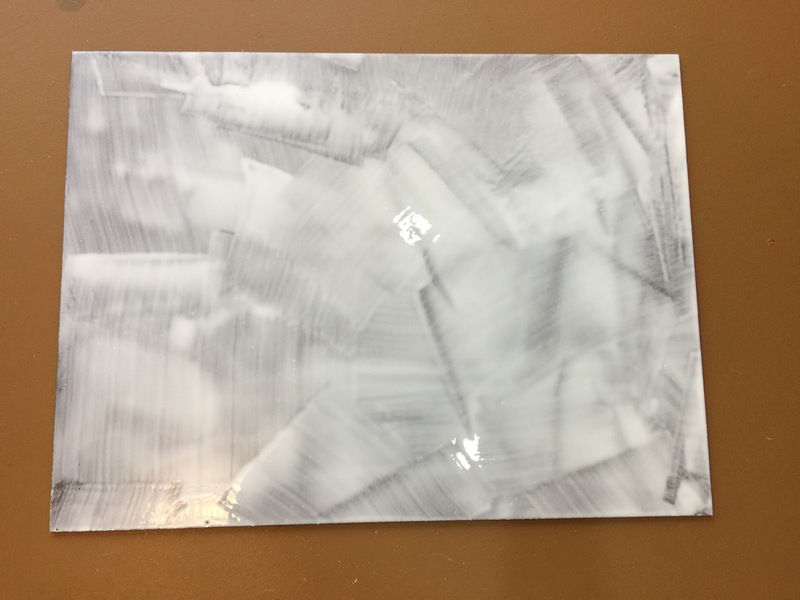 Put some heavy books on top of the panel and allow the glue to dry, overnight is best but at least for a few hours. 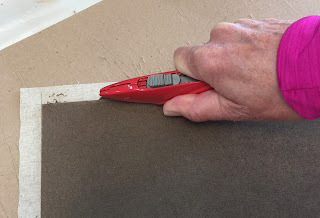 Now all you have to do is trim off the excess canvas with a utility knife- make sure the blade is very sharpe. Do this on a thick piece of non corrugated cardboard. The back of a large sketch tablet works well. 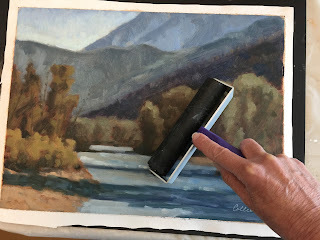 If you find that there is a small amount of unpainted canvas at the edge of your painting you can touch this up and put other finishing touches on the painting, especially if you want areas of very thick paint. I think it is best to wait until mounted for that because I don't like to use the brayer over really thick paint. 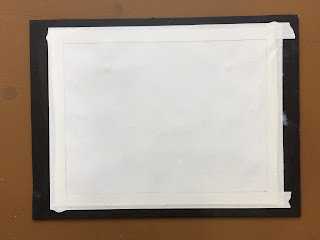 If you want to make your own blank panels do all of the above minus marking the lines on the front and back of the canvas. 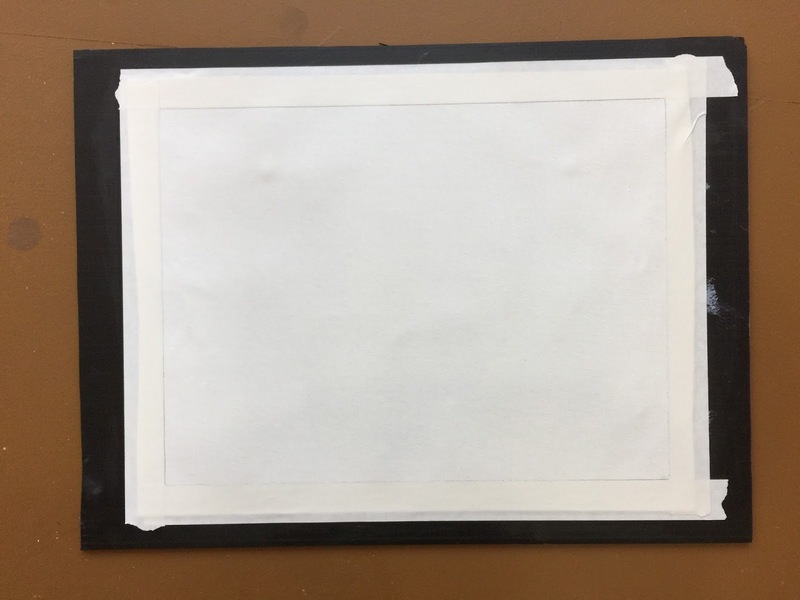 And consider this- you can use unmounted canvas for exercises in workshops or for small studies. Instead of mounting them, store them in a notebook or file folder for future reference to save space. 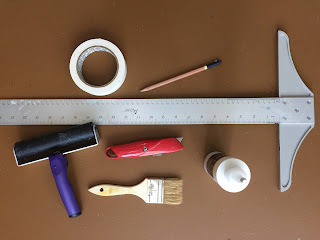 Any hardware store will have cheap wide brushes (or foam brushes) and utility knives. For the brayer- https://www.amazon.com/Inovart-Roller-Soft-Rubber-Brayer/dp/B0044S5BC6/ref=sr_1_27?s=arts-crafts&ie=UTF8&qid=1488841643&sr=1-27&keywords=brayer There are so many that would be fine, this is just an example. Important- if you paint outside get the black ones so the light won't go through your canvas. If you are only going to use this indoors clear is fine. Tip- cut these in sizes that fit into your wet panel carriers. I like this product but as I said they are a little too thick to double up in the carriers but are very light and strong. 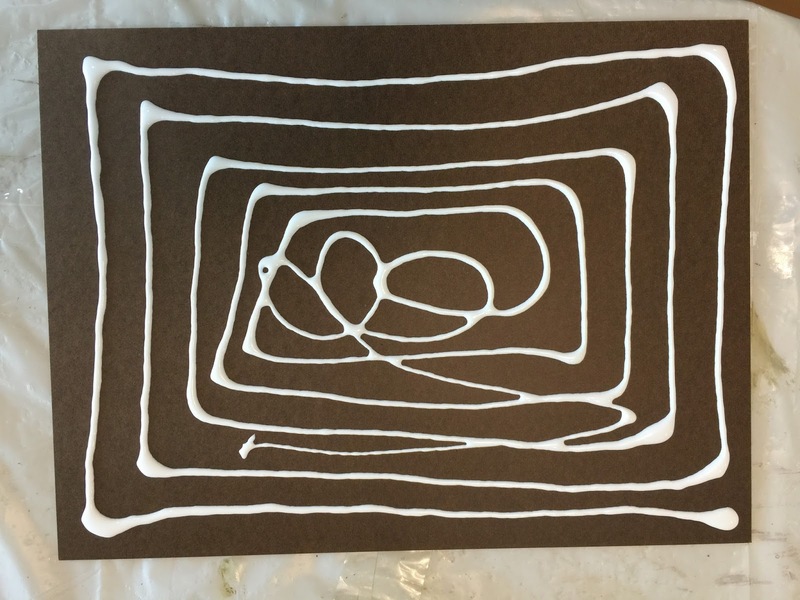 Many thanks to artists Pat Schwert and Judy Elias for all of their input and helpful instruction.